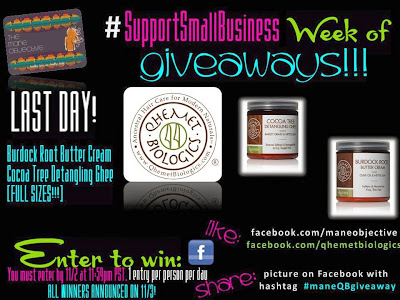 The Mane Objective: #SupportSmallBusiness Week of Giveaways LAST DAY: Qhemet Biologics! #SupportSmallBusiness Week of Giveaways LAST DAY: Qhemet Biologics! It's the end of the giveaway week ya'll! This has been a fun ride. Let's end things with a bang on Facebook with Qhemet Biologics!!! Share the giveaway graphic on The Mane Objective Facebook page on your time line with the hashtag #maneQBgiveaway. That's it and that's all! Be sure to enter by 11:59pm PST. All winners announced TOMORROW!!!!! !